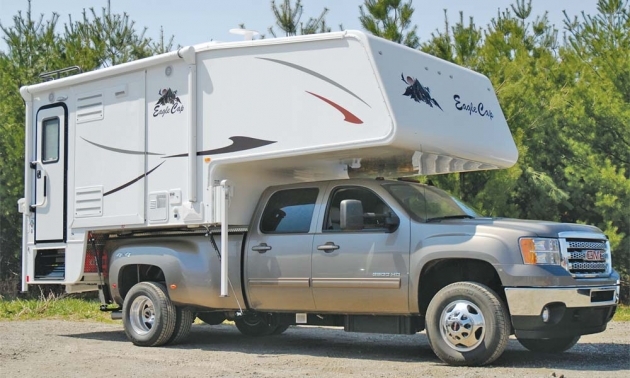 We photographed the Eagle Cap camper on a GMC Sierra 3500 HD duallie – an excellent combination for RV adventures! There is only one word to describe the Eagle Cap 1165 Triple-Slide truck Camper from Adventurer LP – WOW! 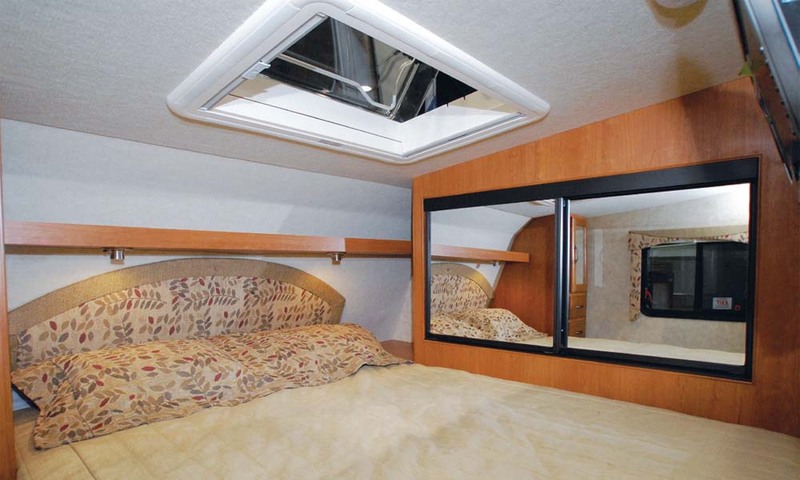 With the three slide-outs extended, the interior layout of this camper is incredible – from the living room and galley to the front bedroom, the impression of space feels more like a compact fifth wheel than a truck camper. 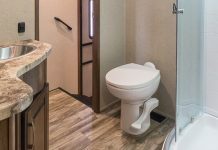 Even the bathroom is large by truck camper standards – with a shower and a vanity cabinet that are rarely seen in a unit in this category. Looking at the floor plan, you begin to see the logic for this innovative approach to truck camping – but the real genius lies in the engineering. Eagle Cap has utilized an above the bed rail floor design to maximize the interior space. 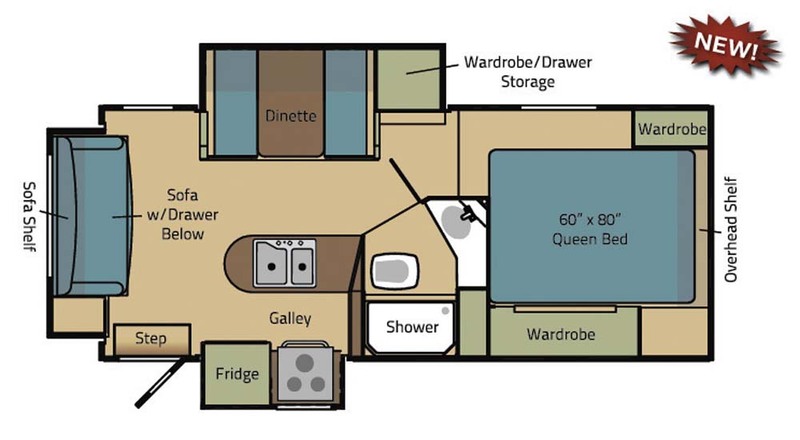 The three slide-out sections house the dinette, the rear sofa, and the galley appliances – three components that usually take up the majority of space in a truck camper. By moving these elements out of the basic shell of the unit, and placing an island kitchen cabinet directly above the water tanks, the engineers have created a spacious rear floor plan without affecting the balance of the unit. Add the optional U-shaped dinette and you can entertain five adults, plus three more sitting on the rear sofa… eight people in a truck camper, enjoying the Sunday afternoon football game on the LCD TV – simply amazing! 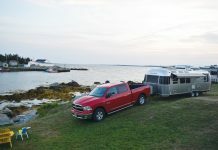 Keeping in mind that this camper tips the scales at a dry weight of 4,525 pounds, and it is designed to fit into a long-bed pickup truck, the touring versatility of the RV combination is impressive. Ideally suited for a one-ton pickup, it mates beautifully with a duallie – the wide rear stance providing the stability you want for extensive travelling. For North American touring, you must consider that some jurisdictions allow people to ride in the truck camper, and some forbid this. 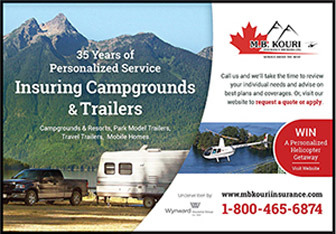 We have always felt that the only safe way to tour with a truck camper is to have the passengers ride in the truck. 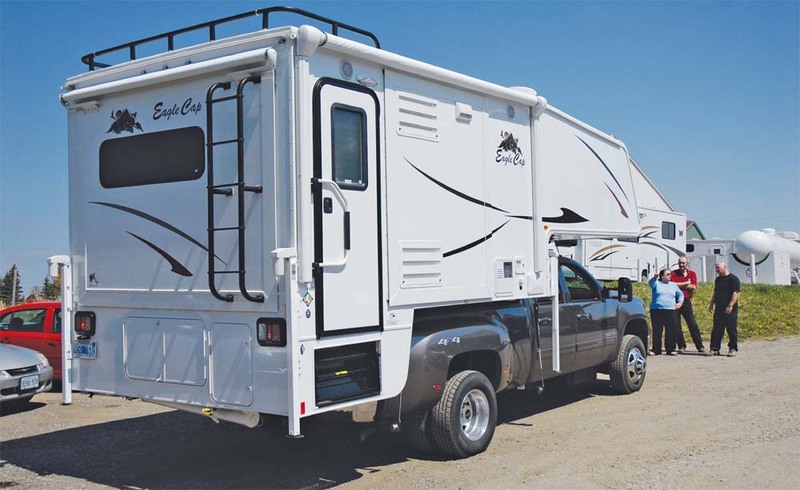 For camping, the sofa and dinette beds in the Eagle Cap 1165 each accommodate two people, plus two in the master bedroom – that adds up to a sleeping capacity of six – the full passenger complement of a crew-cab truck. 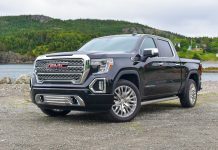 Our truck of choice for this road test was a GMC Sierra 3500 HD 4X4 with the optional 397 hp 6.6L Duramax® diesel V8 and the 6-speed automatic transmission. The truck features heavy-duty torsion-bar front suspension, 3-stage multi-leaf spring rear suspension, and 17” 8-lug painted steel wheels. Our test vehicle was equipped with Michelin LT235/80/R17 with TPC spec 2025 MS, load range E (2835 lbs at 80 psi). With the slides retracted, the camper is ready for the road. Note the automatic awning on the passenger side, the slide-out awning at the rear, and the Happijac stabilizers, stowed for travelling. 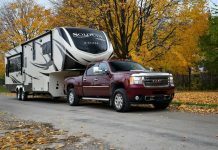 As with any truck camper, you can decide whether to leave the camper in the bed of the truck, or remove it at the campground or at your home to free up the truck for other adventures. The Eagle Cap we tested was equipped with special Happijac struts with swing-out extensions to accommodate the width of the duallie. These jacks, from Lippert Components, are operated by a wireless remote control that lets you raise or lower the camper and level it in a matter of a few minutes. 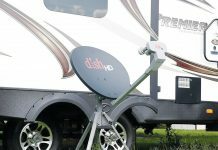 Once your dealer fits the camper to your truck, it is a relatively simple process to remove or reinstall the unit. Keep in mind that it is a good idea to have the load bed coated prior to installing a truck camper, and you may require a pair of 2 x 10 boards to raise the camper above the height of the truck sides on some models. 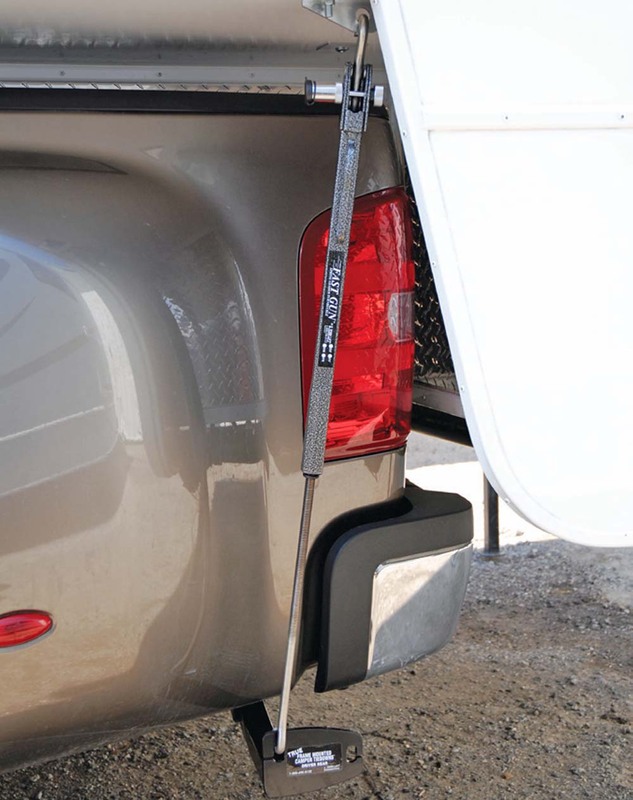 Most truck camper aficionados place the wood under the camper to provide a buffer between the bottom of the camper and the surface of the load bed. Some people use a thick rubber mat for the same purpose. Centering the camper in the load bed takes a bit of practice – you want to have equal amounts of clearance between the camper and the truck at the front and rear of each side. Once you determine the correct position, you can turn your head and look through the rear window of the truck, and use a grease pencil to make a mark on the rear window, and ask a helper to make a corresponding mark on the front of the camper. After this, you just line up the two marks as you back the truck into position. The truck camper must be secured to the truck for travelling safety. The camper has stainless steel tie-down brackets, bolted through the aluminum superstructure. 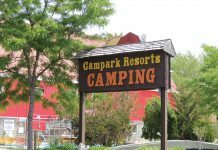 We used a system of TRUE Frame Mounted Camper Tie-Downs and FastGun spring-loaded turnbuckles from Torklift International. We secured the turnbuckles with four Master Lock hitch pin locking devices. Adventurer Manufacturing has a long tradition of utilizing the best quality materials and excellent craftsmanship. This model proudly sports contemporary fabrics and materials that promise years of durable service. 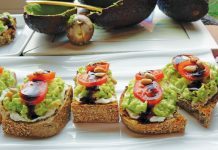 We were impressed by the hand-upholstered valances, miniblinds for all windows, curtained front and rear bulkhead windows, and no-wax vinyl floor coverings. The Eagle Cap camper features an exclusive hybrid aluminum/fiberglass superstructure, with a “Full Front Camper Cap” made of one-piece high gloss gelcoat fiberglass. The camper is built with an exclusive all-season triple exterior sealing process. Easy-clean high gloss gel-coat fiberglass automotive finish sidewalls should keep this beauty looking new for many years to come. With the microwave, stove, and refrigerator tucked into the slide-out, the galley takes on a new dimension of space – it is hard to believe that this degree of comfort and convenience can be found in a truck camper – until you step into the Eagle Cap 1165.
Notable exterior construction components include a twenty-six inch wide entry door with screen door and cabover entry step with hinged easy access electrical center. 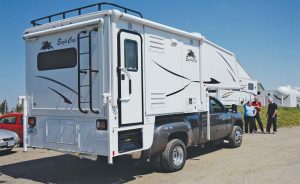 The camper is quite high when mounted on a one-ton duallie, and the four-step entrance may require an additional two-step stool, but there is a large exterior grab handle that folds back against the side of the camper, so entering and exiting the unit is relatively easy. It should be noted that whenever the camper is removed from the truck, the jacks should be lowered to a position that keeps the camper a few inches off the ground – the higher the camper is when supported by the jacks alone, the lower the stability, and the greater the risk of damage to the jack system. The unit is attractive on the outside and bright on the inside thanks to fourseason thermal pane tinted windows. Under the exterior fibreglass skin is a welded aircraft quality aluminum frame superstructure and 2” laminated walls with R-11 insulation factor. The laminated closed-cell block foam insulation provides superior insulation, strength and sealing values. 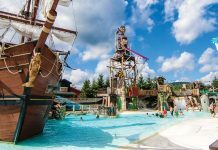 Above your head, there is a 3” crown & trussed roof structure with R-17 insulation factor, covered with a one-piece seamless Thermo Polyolefin (TPO) roof, with a12-year manufacturer warranty. Under your feet, a 2” laminated floor with R-22 insulation factor. Setting up the unit is a cinch. The three electric slide-outs operate at the touch of a trio of switches, extending and retracting in minutes. In the event of a battery failure, the slides have manual override. We tried this once on a similar vehicle, and the manual crank was not difficult to work with, so there is really no need to worry about this aspect of the camper. Lift the insulated compartment doors and you have easy access to your waste tanks and valves (on the left) and your fresh water system. The Eagle Cap camper is equipped with bypass valves for convenient winterization. There is a very accessible centrally located plumbing valve access inside one of the exterior compartments, and an LPG manifold system enclosed in a corrosion resistant LPG compartment. 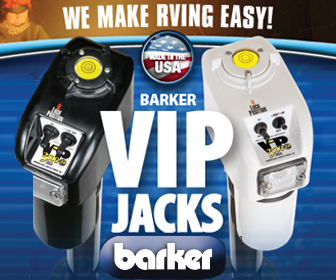 Large dual vertical LPG tanks and an automatic changeover LPG regulator are ideally suited for an RV of this type. Our test vehicle was equipped with an optional Cummins Onan RV QG 2500 generator. All of the exterior compartments feature one-inch thick radius fourseason insulated storage compartment doors, common keyed for convenience. The basement cargo bay storage is large for a vehicle of this type, and there is a compartment where you can store a sewer hose – or your fishing rods, whichever has a higher priority in your vacation lifestyle. You always know where you stand with the Eagle Cap camper, and it is very easy to control your climate within the unit. There is a tank level monitoring system and easy access water heater and electric water pump switches, and a Suburban thermostatically controlled forced air furnace with auto ignition. 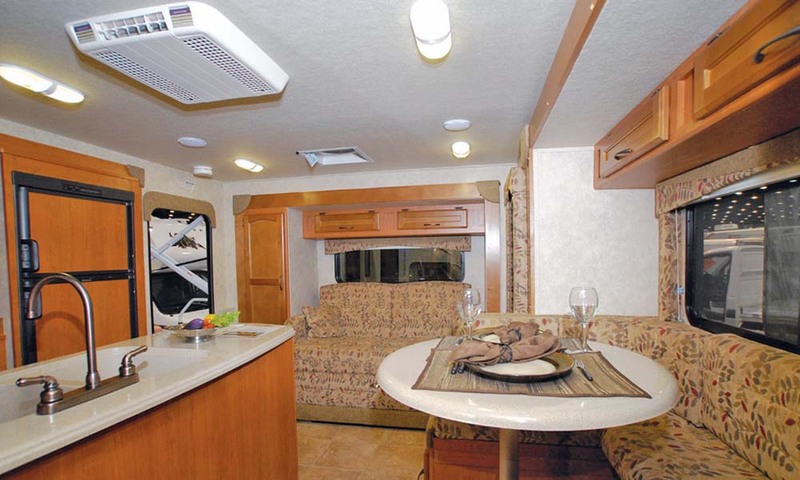 Residential-style ducted heat throughout the unit make this camper a popular model for year-round adventures. The water system in the Eagle Cap 1165 is very well equipped, with 75-gallon fresh water tank capacity with lockable freshwater fill and city water hookups, and Flo-Jet water pump with inline filter. 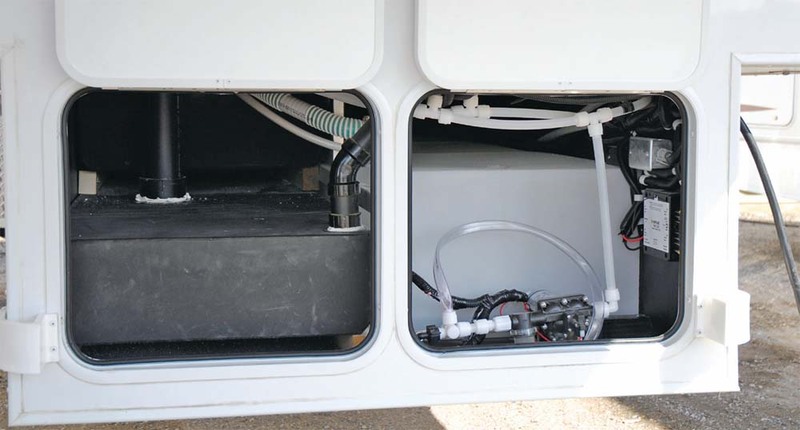 The waste water system is quite large for a truck camper, with 38-gallon grey tank capacity, and 38-gallon black tank capacity. 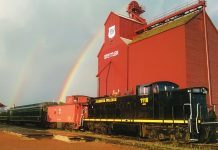 These are four-season holding tanks, enclosed, insulated and heated – and the location is engineered for improved weight distribution and center of gravity. For your convenience, there is a low point fresh water drain with valves, and a single termination point for waste tanks. A black tank flush system takes the “ugh” out of the task. 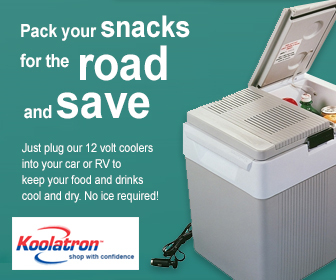 The Eagle Cap camper’s electrical system includes a 45-amp electronic power converter/battery charger and a corrosion proof battery tray or boxes large enough to hold two batteries. A battery disconnect switch prevents excessive drain while the unit is in storage. The standard model is pre-wired for air conditioner, microwave, solar panel, stereo, satellite, and TV antenna – our test unit was equipped with all of these options. We liked the selection of LED interior and exterior lighting for minimal battery draw, and the convenience of wall switched interior LED and porch lights. For camping convenience, there is a long, 110-volt, 30-amp AC service cable in a locking compartment, and 110V GFIprotected patio and galley outlets. 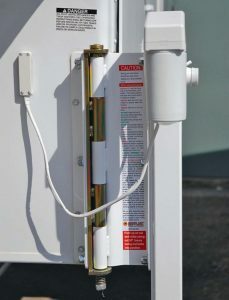 Safety components abound in this camper – standard equipment includes an LPG gas detector, a carbon monoxide / smoke detector, and a fire extinguisher. In the event of a problem that might block your main entrance, there are emergency exits at several points in the unit, including a cabover egress through cabover window or overhead skylight / escape hatch. 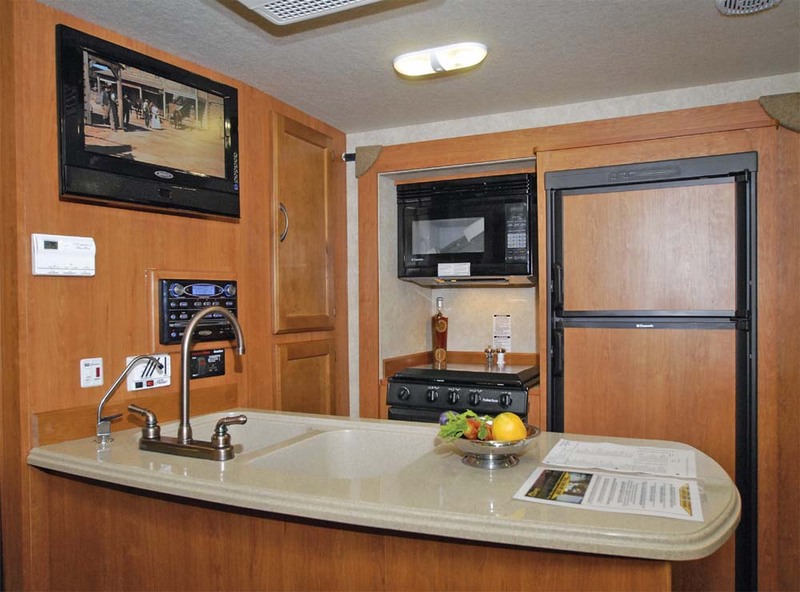 The Eagle Cap camper features many innovative interior decor features, such as full-wall and dinette slideouts, hardwood cabinet doors, all wood drawers with metal guides and travel locks. Hardwood cabinet doors and face frames, with residential- style cabinet hardware and all wood full extension drawers with ballbearing metal guides are better than what I have in my home. The window treatments are stylish, with hand upholstered valances and lambrequins and day-night shades for all windows. The curtained front and rear bulkhead windows offer privacy, and the window height is above the average person’s eye level when your camper is on the truck, so your privacy is assured while travelling. Cabover master bedroom is furnished with a 60” x 80” queen-sized innerspring mattress and décor matching mattress comforter. The pivoting bedroom reading lights and bedroom privacy curtain are nice touches. 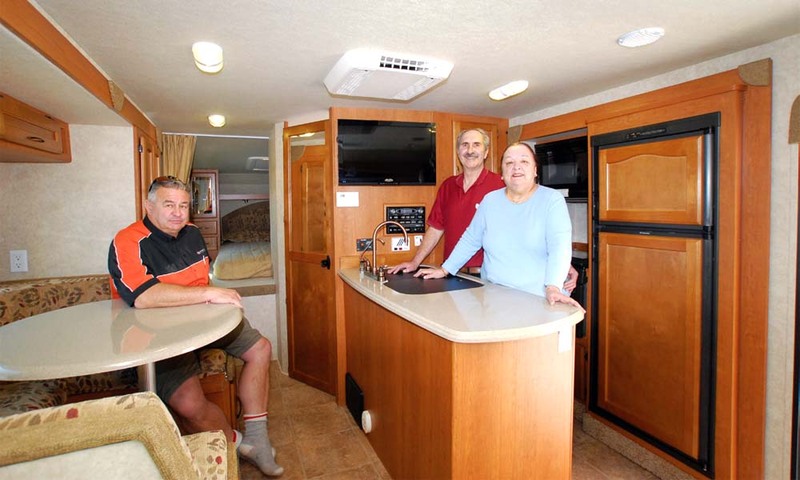 Eagle Cap campers are outfitted with flame-treated fabric upholstery and no-wax industrial grade vinyl floor covering. Entertaining in this camper is a pleasure, with a very well planned island galley, and residential calibre appliances. We like the size and the ease of operation of the Dometic eight-cubic feet double door refrigerator, the microwave oven, and the sealed three-burner cooktop and oven with igniter and bi-fold top cover. The range hood with light and fan is standard equipment. This is a galley that the design engineers have actually tested in the field – you can tell right away, because everything is where it should be, and everything you need is included. We really liked the slide out pantry with adjustable shelves and bolt lock system. Solid granite coat counter tops with large double bowl sinks and a sink cover cutting board make the kitchen island a very functional component of the design. The bathroom includes a full-height one-piece fiberglass shower stall with tub, a fresh water flush toilet on a raised base for increased seat height, and a lavatory sink with residential-style faucet. You have lots of hot water thanks to a 6-gallon DSI gas water heater with insulated tank. The bathroom has an exhaust vent with fan and a large medicine cabinet with mirrored door. 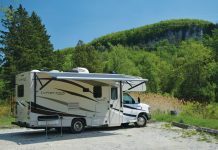 For a truck camper that is essentially the “top of the line” within the category, this Eagle Cap is an excellent value at a base price of approximately $41,000. 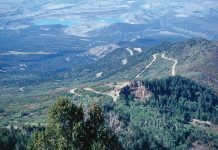 It is best enjoyed in conjunction with a duallie, when it can truly venture far beyond the realm that is accessible to any other type of RV. Mount the Eagle Cap camper in a 4×4 with off-road capability, and you have an RV that can literally take you anywhere your heart desires. 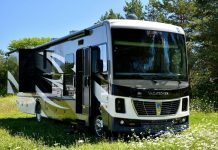 Our RV Lifestyle Road Test was a whirlwind adventure that spanned the continent – the Eagle Cap 1165 truck camper was manufactured on Friday at the Adventurer LP plant in Yakima, Washington and shipped right away to the Fraserway RV location in Cookstown, Ontario. 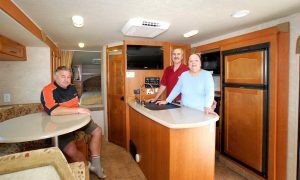 At the same time, the new owners of the camper, Mike and Evelyn Laberge, left their home in Dartmouth Nova Scotia, heading for Ontario. We all met at Fraserway RV on the Wednesday after the camper was manufactured… five days, 5,911 km.